Hello Monday! Tell me, how did you spent your weekend? Here and there I read about the 'unofficial start of Summer' the first of June. Well I'm feeling it. Hopefully you do too! Because of an official holiday last Thursday we had a four day weekend, so my latest blogpost feels like ages ago. Not in a bad way though, it felt like a little holiday, grasping Summer feelings. My hours spent at the beach last Saturday also were very helpful on that. But it seems those feelings won't last very long: today was filled with clouds and rain. So, trying very hard to hold on to it I think a nautical moodboard is on its place. Sending you lots of Summer vibes for a great week to come. Those images feel so nautical I can hear the waves! Perfect to get summer started! I would LOVE to have that dress...wow! so pretty! and perfect since my weekend was spent at the beach for a wedding. Yeah that's what they say but this June has been rainy so far! We were so lucky to have a semi-sunny day on Sunday to hike amongst the pine trees. 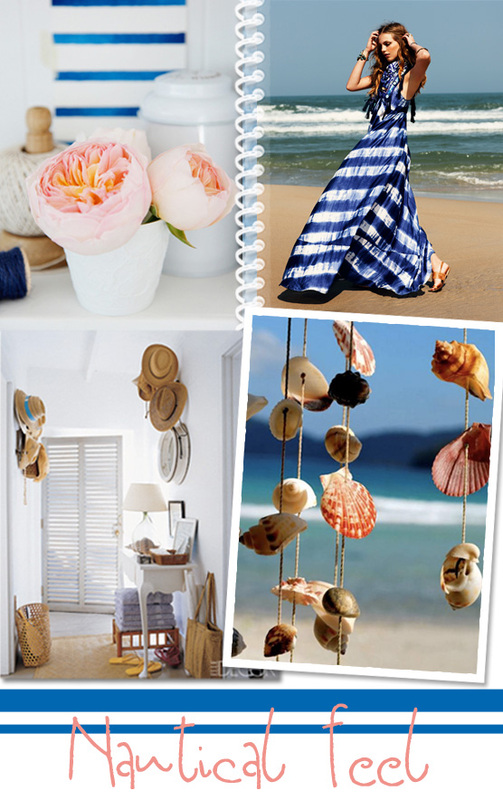 Love the nautical blue and white stripes.. this is how summer should be! I love the tropical collection that blue maxi dress is beach bum chic! Glad you had a great time at the beach. I'm loving that dress, perfect for the season. Loving these colors and looks! Definitely a great spin on the usual red...peachy pink!